2019 Feb 02	Saturn (0m.6)	Time of conjunction: 07h 05.4m U.T. 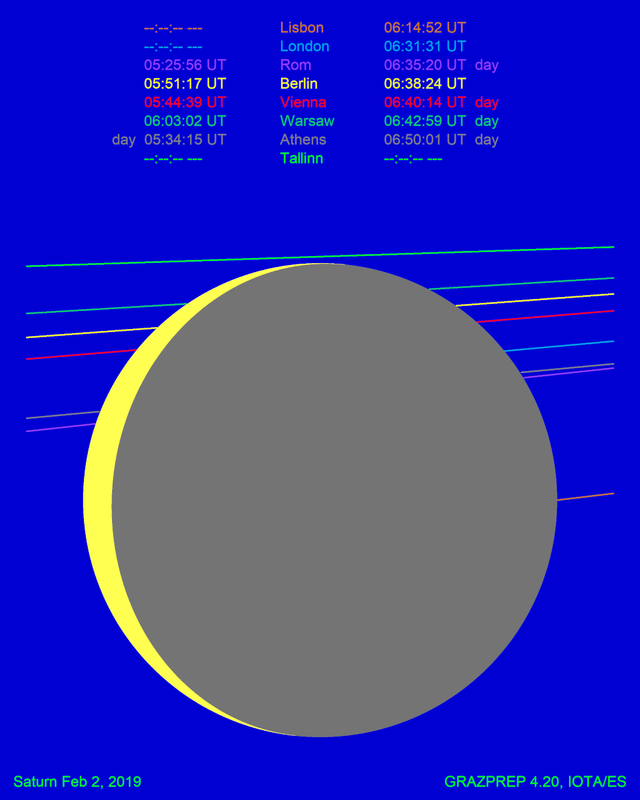 This occultation will occur in the morning hours. It will be hard to observe. For locations in West-Europe, the Moon is close to the Eastern horizon and only the reappearance at the dark limb will be observable. The beginning of dawn makes it even harder. As dawn starts earlier for eastern Europe, the disappearance on the bright limb may be observable. A graze at the northern limb of the Moon is predicted for observers on a line from Riga, Latvia to Sundsvall, Sweden.